The latest techniques are going to be used in the following days to continue a scientific programme of the wild horses return project coordinated by European Wildlife organisation. On Monday and Tuesday experts are going to start monitoring a rare steppe locality at Milovice, in central Bohemian in the Czech Republic, with the help of a remote-controlled unmanned plane – a so called drone. 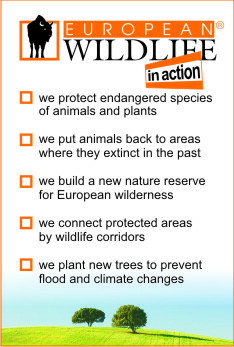 A unique project of European Wildlife organisation has caught the attention of leading world media on five continents. The return of wild horses to Milovice, a former Soviet Army military area, has in the past days became the most followed news item from the Czech Republic in mainstream media abroad. American titles The New York Times and The Washington Post, for example, have a report about it in their on-line versions. After about a four-day long journey, a seven-year-old stallion called Northcroft Firestarter arrived in Central Bohemian Milovice today, half an hour after midday. It joined a group of fourteen mares which has been in this locality since 28th January. The transport with the stallion set out from the north-east of England on Thursday, April 2nd, and they left the port of Dover in the south of England on Saturday, April 4th. Instead of Soviet army tanks there are wild horses coming from England. That is what it looks like, from today, in the former military area of Milovice in the Czech Republic, which was occupied by one hundred thousand Soviet soldiers and their families for two decades. While the last transport with the Soviet soldiers left Milovice on 19th June 1991, today fourteen wild horses have been released into the former exercise area.